This week's surprise link also comes courtesy of Lynda. So go to the sidebar, click on it and do some good. Like she says: "Seems simple enough." My review of Nikki and David Goldbeck's American Wholefoods Cuisine is up on Fitfare, so go check it out. Blogger was down most of the day so I couldn't post anything earlier and I've got a lot of stuff to do tonight, so this will be a short post. 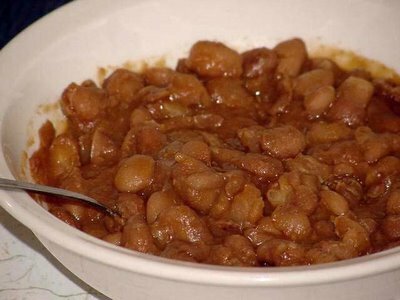 I know you must be sick of my beans by now, but I just wanted to show you how the slow-cooker beans came out. These are the beans I had on back when it was too hot to cook. I'm pleased to say they were an unqualified success. In fact, I might just like these a teensy bit better than the oven-baked beans, and these won't heat up the whole house while they're cooking. There was more sauce using this method. I used the same basic ingredients as I did for the baked version, except I used dried onion instead of real and I didn't cook the sauce before mixing it with the beans. I just threw everything into the slow cooker, covered it, turned it on, and forgot about it for a couple of hours. Set on high it cooked pretty fast. Place all ingredients in slow cooker and mix together. Cook on high for approximately four hours, or low for approximately 6 hours, or until done. Are you taunting me? I can't find any beans. Just canned, and the british kind you put on toast. Hmmmm, I was looking for white cannelini beans to mix in with tuna, nope, I saw a bunch of imported refried beans in a can though, but then it's not the same. I love beans. Today, I'm going to check out a new grocery store called Taste, it's supposed to be very cool and cheaper than City'super. Did you know that almost all fruits and vegetables in HK are imported? I have discovered a new item - Dragon fruit. Very unique, I will put a picture on the blog. No beans in Hong Kong? That just can't be. I hope you find some--I can't imagine what I'd do without them. Found canned cannellini at TASTE,also red kidney beans and garbanzos, yum. But I have yet to see any dried beans in packages. Also at TASTE I found RED dragom fruit - dare I say, Very exotic! Ok. Fourth and last time I try to leave a comment--I'm glad you found some beans, Yam. If you can't find dried, then canned can be your friend! And if you want any recipes, I have tons LOL.